Are you looking for a cosmetic dentist in Wythall, Solihull or Birmingham? Are you unsure about your cosmetic dentistry options but would like to transform your smile to look good and feel great? Would you like whiter teeth for a special occasion or perhaps your wedding day? Do you have rotated, spaced or uneven teeth that are preventing you smiling or holding you back in your personal or professional relationships? Are you searching for a cosmetic dentist in Birmingham that can provide affordable porcelain veneers? If you are unhappy with the appearance of your teeth, you're not the only one as one in four of us here in the UK aren't happy with our smile. The good news is that the talented and professional team at Omnia Dental Spa can help you. We appreciate that one of the first things that people notice about you is your smile, so we understand that you want your teeth to look their very best. As the saying goes, you never get a second chance to make a first impression – so make it a great one ! As some of the regions leading cosmetic dentists, Dr Tirj Gidda and Dr Louise Gidda can carefully correct any imperfections and brighten your smile to achieve a beautiful, natural-looking result. The cosmetic dentists at Omnia have helped transform the smiles of thousands of clients, just like you, with life-changing benefits. Our team will always discuss the various treatment options that are available to you and then recommend the most appropriate solution for your individual dental problem. We will always endeavour to get you smiling with confidence! Emax porcelain veneers are a durable and aesthetic method of restoring a tooth that has been weakened, fractured, discoloured or damaged by dental decay or an accident. Porcelain veneers are a very popular form of cosmetic dentistry and are commonly used to improve the colour, alignment and symmetry of the most visible front teeth. Dental veneers can also be used to close spaces between the teeth and to give the teeth a straighter appearance when braces are not appropriate or desirable. Porcelain veneers often feature in the cosmetic 'smile makeovers' that you may have seen on television programmes such as '10 Years Younger'. At Omnia Dental Spa all of our Emax porcelain veneers are carefully crafted by our very experienced and talented team of master dental technicians. Each restoration is bespoke and is handmade to fit your individual tooth. The shade of the restoration is precisely matched to the natural shade of your teeth to ensure the best possible cosmetic result. In fact, the results are so life-like that it is often impossible to tell that the tooth has been treated at all! Porcelain veneers are generally considered to be a very conservative form of cosmetic dentistry as they require minimal or no reduction of the teeth. This is especially true when the veneers are being used to align an 'in standing' tooth (a tooth that is set back relative to its neighbouring teeth) or to close spacing between the front teeth. 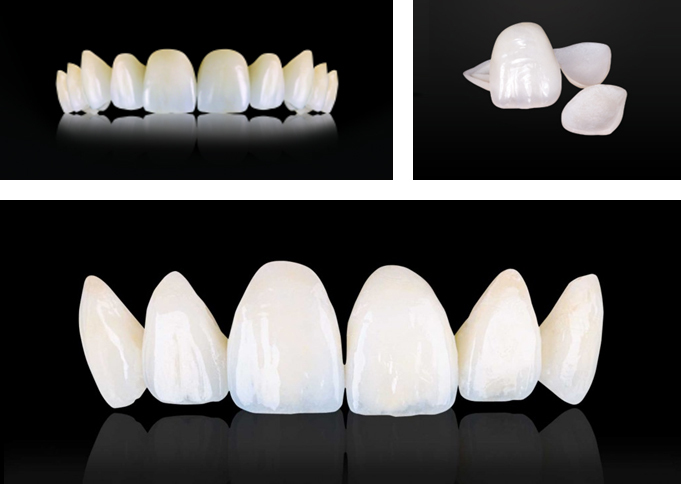 Emax veneers have been used to close the spaces between these upper incisor teeth. A fabulous improvement in shade, alignment and symmetry – beautiful! Call us today on 01564 822 224 if you would like to learn more about how porcelain veneers can be used to achieve YOUR dream smile in just 7 days. What is a dental porcelain veneer? A dental veneer is a very thin layer of porcelain that is custom-made to precisely fit over the front surface of your tooth. The veneer is bonded to the tooth using a very strong adhesive. The veneer fits on the tooth a little like a false fingernail fits over a nail. Which dental problems can porcelain veneers treat? As with most dental treatments, the lifespan of a veneer depends greatly on oral hygiene, diet and how well you follow your dentist's advice on care and maintenance. Generally, porcelain veneers will last many years and typically will need to be replaced after 5-10 years depending on your homecare. A good oral hygiene regime, including daily flossing, will help to maximise the life of your dental veneers. The price of porcelain veneers varies depending on the type of veneer and the dental laboratory chosen to produce the veneer. As a general guide, an Emax porcelain veneer will normally cost between £400-£500 depending on the laboratory selected. Your dentist will always discuss your treatment options with you and provide an accurate printed quote before any treatment is undertaken. If you are looking for a caring and affordable cosmetic dentist in the Wythall or Solihull area and would like to learn more about your treatment options, please call Omnia Dental Spa on 01564 822 224. We firmly believe that our unique combination of expertise, friendliness and commitment to 5-star service, makes us the best cosmetic dental practice in the Wythall and Solihull areas. 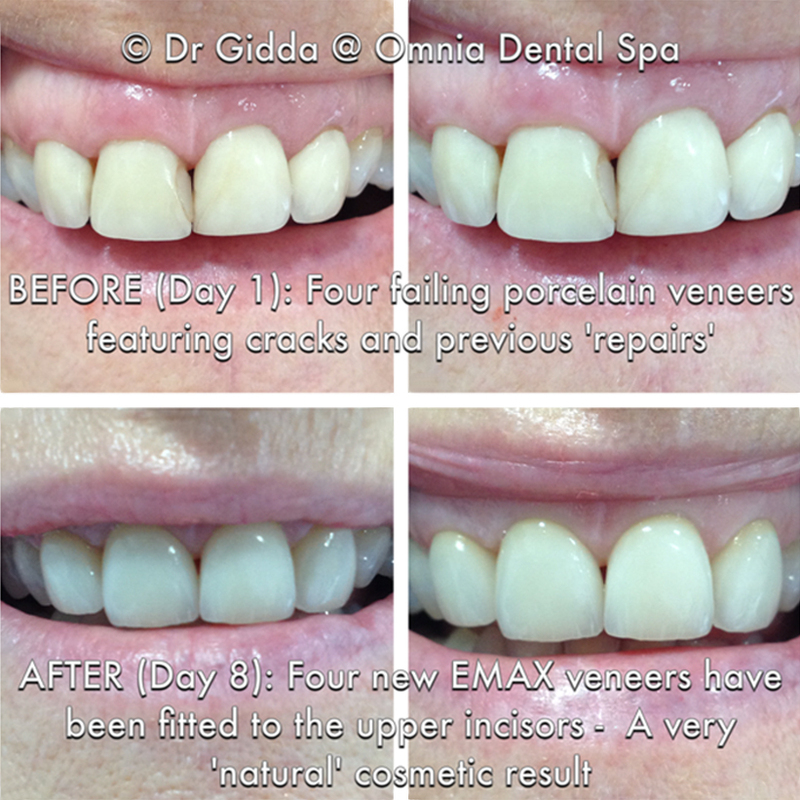 The photographs below demonstrate some of the life-changing results that we have achieved at Omnia Dental Spa using Emax porcelain veneers. Call us today on 01564 822 224 if you would like to learn more about how Emax porcelain veneers can be used to enhance your teeth and achieve a truly beautiful smile.